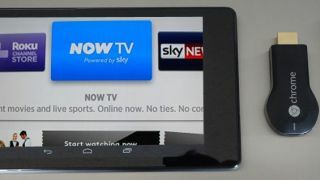 Fresh on the heels of the launch of its low-cost Now TV Box, Sky has confirmed to TechRadar that it would indeed consider a Chomecast app should Google's TV streaming device hit the UK. Sky has long pronounced that it is looking to leverage its content across major platforms, and its Now TV subs-free service is proving to be a popular addition to many services. Google's Chromecast is US only at the current time, but is expected to arrive in the UK at some point, and when it does Sky will look at the platform. "If and when it launches in the UK, we'd take a look at it, as we do all potential distribution platforms," a spokesperson told us. Google has just five current Chromecast enabled apps - only one of which, Netflix, is not owned by Google. But that is expected to change and Sky's interest will be encouraging to the search giant ahead of any UK announcements. Last week, Sky launched a £10 streaming device based on the Roku (a company it has invested heavily in) which has proven to be a critical hit. Indeed TechRadar's Now TV Box review gave the device a whopping four-and-a-half stars, pointing out that the bundled HDMI cable made it even more of a bargain. There is a big push from Sky for its subs-free services, and it makes sense to get it to as large an audience as possible. The company has already told TechRadar that it is looking to the next-gen consoles the Xbox One and the PS4, as well as being on LG Smart TVs, streaming boxes and YouView.